The monks at Waverley Abbey near Farnham in the 12th century introduced highly effective husbandry methods for rearing sheep and triggered a clothing industry that was to thrive for 800 years. Although the production of cloth and linen, and the processing of leather, was common all along the Wey Valley, the clothing industry became heavily focused on Godalming at the head of the Wey Navigations. This industry provided the town with much of its wealth until the end of the 20th century. There are many clues about the industrial past of every town in the names assigned to streets and places. References to 'hammer' and 'shot' suggest a past association with the iron industry, and is common along the Wey near Haslemere in Surrey. Others relate to the clothing industry, for example Racks Court referring to the racks used for drying cloth, and brewing. The Environment Agency has direct responsibility for monitoring and policing the Wey for pollution, especially that resulting from deliberate or negligent discharges of contaminants. The Agency investigates and prosecutes offenders, one example being the contractors who were decommissioning a factory in Alton. They had allowed waste ammonia to discharge into the river and managed to pollute a 13 mile stretch of water killing 6,000 fish in the process. The Wey Valley for many centuries was an important centre for the manufacture of cloth and leather with markets not just in Britain but abroad in Europe too. The early Wey textile industry made woollens, and this developed into more refined processes including framework knitting, and the manufacture of silk and linen. The leather industry was also a significant contributor to the economy of the valley too. The clothing industry in the 16th century had become so economically important to the Wey Valley that special laws were introduced to protect and control it. In 1530 it became illegal to produce cloth outside of the market towns so the industry became heavily concentrated around Guildford, Farnham and Godalming. 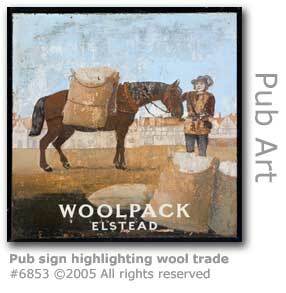 This early textile industry used short-stapled wool that was prepared by carding. 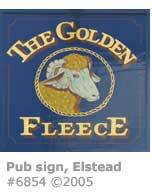 Once sheared the fleece was scoured to remove debris the sheep had picked up. Once washed the wool could be dyed at this point, which was referred to as stock dyeing. Dyeing could also be undertaken at the spinning stage or after the cloth was woven. The cleaned wool was passed to the carder who used pairs of hand-held boards (cards) that were studded with wire, and the wool was placed between the two boards, one being pulled repeatedly over the other to open up the wool locks and combine the fibres running them parallel ready for spinning into yarn. The wool at this stage would then be graded and sold by a stapler to the spinners and weavers who usually operated close to the watermills. Grading determined the value and final use of the wool, with short fibres usually of 3 inches (7.6 cm) or less being spun into woollen yarns, and the longer fibres spun into worsted yarns. SHEEP ARE NOT SO DUMB AFTER ALL - NEW RESEARCH REVEALS! Spinning is the process of twisting the carded fibres into a long continuous thread. The unmechanised process used a spindle, which is a tapered stick about eight inches (20 cm) long fixed through a wooden flywheel or whorl. A short length of twisted thread was formed from the yarn between the fingers and wrapped around the end of the spindle. The spindle was held up to be suspended by the yarn and given a twirl. The weight of the whorl keeps the spindle spinning hence twisting the yarn into thread. This process was continually repeated with the thread being wound onto the spindle near the whorl in between spins. The invention of the spinning wheel took the spindle and provided a fast mechanised way of spinning the yarn into thread. Spinning and weaving tended to be domestic occupations and were worked on by families in their own homes. It was usually the men that undertook the laborious task of weaving and it was left to the women to spin the yarn. Clothiers contracted the cloth from the weavers, and it was the clothiers who would pay the millers to have the cloth fulled. Many had their own mills and undertook the finishing processes directly. If the cloth hadn’t been woven from dyed yarn it would be dyed as finished cloth, usually by specialist dyers either acting as an outside contractor or employed directly by the clothier. Once woven, the cloth was put through the fulling process to remove the natural wool grease or lanolin, and any remaining dirt. The lanolin as a by-product, once purified, was sold for use in soaps and cosmetic products. Fulling at the mill was performed by pounding the newly woven cloth with mechanised hammers, whilst soaked in a solution containing the Fuller’s earth. Prior to mechanisation this process was undertaken by the laborious method of treading the cloth in a tub by the bare feet of ‘walkers’. The surnames Fuller, Walker and Tucker (‘tucking’ being an alternative term to fulling or finishing) all derive from the fulling process. Fulling also enabled the cloth to shrink and thicken, and the pounding strengthened and smoothed the cloth. The fulling process usually involved three poundings by the hammers, a very noisy and foul smelling operation given the solutions used. The first, after the cloth had first been washed, was pounding the cloth in a solution to loosen the grease. In the early days one of these was mixed with urine (ammonia being a highly effective chemical) collected by the cask from the cottagers, who were paid a penny a bucket. The second used a solution of Fuller’s earth, and the final pounding a soapy solution. Fuller’s earth (Calcium montmorillonite) had a wide range of industrial applications. It had the ability to absorb large quantities of grease, so before cheap soap and modern detergents became available it was extensively used in the fulling of woollen cloth. The use of Fuller’s Earth in England was introduced by the Romans and was for centuries dug from bell pits to be sold on to the woollen mills. At the end of the 18th century one William Grece was the first person documented as having established a business devoted to the extraction of the commodity. Such was its commercial importance along the Wey Valley, laws preventing its export had been introduced to protect the clothing industry. These were not repealed until 1825. Dye was traditionally made from substances naturally available. Blue dye was produced from woad (Isatis tinctoria) and was grown extensively along the Wey Valley having been cultivated here from prehistoric times. The ease of availability of woad resulted in the plant being used for the popular blue body paint used by ancient Britons in battle. Woad is recognisable by its arrow-shaped leaves and clusters of small yellow flowers. It can grow to a height of 4ft (1.2m). The best quality of blue dye was produced from woad imported from France until the 16th century when the government encouraged its growth locally. There is evidence around Wanborough, now part of Guildford, and Godalming of wide scale cultivation of woad by clothiers in the 17th century. Although woad as a crop was more than six time more profitable than corn the plant rapidly exhausted the soil causing soil fertility problems. Eventually woad was replaced by indigo imported from the Indian subcontinent, which contains the same dye elements but gave a far stronger colour and was less costly. The roots of the madder (Rubia tinctorum) plant produced red and purple dye; the sanderswood (Pterocarpus santalinus) tree heartwood was favoured for brown; young fustic (Rhus continus) for yellow; brazilwood (Caesalpinia echinata) tree heartwood for red; logwood (Haematoxylon campechianum) tree heartwood for blues and black; greenwood (Genista tinctoria) for yellow; and rocket (Reseda luteola) for yellowish-green. 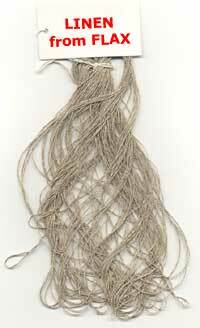 Alum root and oak galls were used as a mordant to fix the dye to the cloth, and prevent it from running. Many of the tree wood dyes became available in the 16th century after Elizabethan explorers encountered new lands and established trade routes to import them. Prior to that period many of the dyes available were quite bland and limited. Retting is the process of soaking flax plants in water until the soft tissue of the plant separates from the fibres that are used to make linen. Retting was a common skill along the Wey and flax was grown widely along the valley for many hundreds of years, its long heritage is emphasised by the fact that the words ‘flax’ and ‘linen’ are both of ancient Anglo-Saxon origin. Retting was undertaken by either spreading flax out on the ground and regularly soaking it with buckets of water over a period of 20 – 30 days, or it was submerged in pools of gently running water. Flax (Linaceae limum) is a slender blue-flowered plant with strong woody fibres and was the first textile to be spun by man. The hollow flax fibres are twice as strong as those of cotton, and five times that of wool fibres, providing a very durable material. When linen fell out if favour with the introduction of cotton, the cloth was still widely used for sails, sacking and furnishing. Today flax is still grown in Britain for spinning into yarn and new innovations have incorporated the plant into the manufacture of packaging materials, reinforcing plastics and concrete and as an alternative for fibreglass and insulation. The Wey Valley typically had large numbers of small-scale tanneries scattered around the towns and villages, making use of the locally kept and slaughtered animals. There was an array of specialist trades operating in the tanneries along the Wey in the 18th and 19th centuries. Skinners as the name implied removed the hides from the animals; fell-mongers who removed all traces of wool from sheepskin; tanners who impregnated the skins with tannin from oak (Quercus) bark or from the sumach (Rhus glabra) tree; curriers who refined the leather to make it more supple; and cordwainers who made up leather for shoes. There were also many different processes for preparing leather according to its intended use. The starting point was for the skins to be impregnated with tannin to turn them into leather, and those tanneries using bark would have their own bark mills for grinding to allow the tannin to be extracted. There was a bark house built next to the tannery in Mill Lane in Godalming in 1808. Different types of leather were produced by using different impregnation agents. Impregnation with alum, a process called tawing, produced the very soft kid leather particularly favoured in glove manufacture. The fine chamois leather required a great deal of preparation and hence was expensive. The outer surface of skin had first to be removed by ‘frizzing’ which produced a softer more pliable texture, and then oil was beaten into the skins by machines similar to those used in fulling. 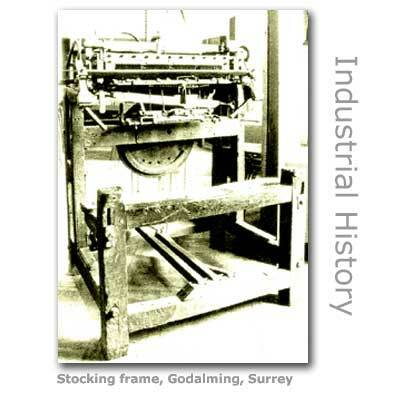 Godalming was an important Wey Valley leather manufacturing town which had a good number of tanneries operating there during the 19th century. As well as the tannery in Mill Lane there were others near Meadrow downstream, and at Westbrook Mill. Many of the tanneries along the valley closed in the early 20th century but the tannery at Gomshall by the Tilling Bourne river, one of the Wey’s tributaries, continued well into the 1980s. Sheep are not so Dumb After All! 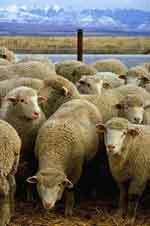 Researchers from Utah State University have released (May 2006) new research revealing the true intelligence of sheep. Scientists have observed that sick sheep can accurately self-medicate for stomach problems. Sheep given food which made them unwell were able to quickly select and eat the right cures for constipation and heartburn. Other researchers at Cambridge University have been researching how sheep can identify and remember faces, both human and ovine, distinguish between happy and depressed expressions, and tell one sheep's bleating from another. "We now have a fair amount of evidence that sheep are not dumb," said Keith Kendrick, Gresham professor of physics at Cambridge. "In fact, they can be quite cunning in terms of getting in and out of things, and coming back and looking as if they never went out in the first place." Professor Kendrick and his researchers have been investigating face and emotion recognition among sheep, and their findings will be released later this year. "It is a review of how sheep process faces and emotions. We have found that sheep can recognise both human faces and emotions, and emotional changes on sheep faces. They are also able to form mental images of faces. They can recognise at least 50 different faces, and remember them for a couple of years or more," says the professor. "They are quite sophisticated in their social environment. They know what a happy face looks like compared to an angry one." Researchers at the French Behavioural Ecology Group have confirmed that ewes are able to recognise the individual sounds of their lambs. "Our results show that ewes and their lambs can recognise each other based solely on their calls." Tourist: Uh ... those ARE sheep aren't they? Tourist: Only, what are they doing up the trees? Shepherd: A fair question ... It's my considered opinion that they're nestin'. Shepherd: Exactly. These sheep are labourin' under the misapprehension that they're birds ... Witness their attempts to fly from tree to tree. Notice that they do not so much fly as ... plummet. Tourist: Yes, but why do they think they're birds? Shepherd: Another fair question. One thing is for sure, the sheep is not a creature of the air. They have enormous difficulty in the comparatively simple act of perchin'. Trouble is, sheep are very dim. Once they get an idea in their 'eads, there's no shiftin' it. Tourist: But where did they get the idea?